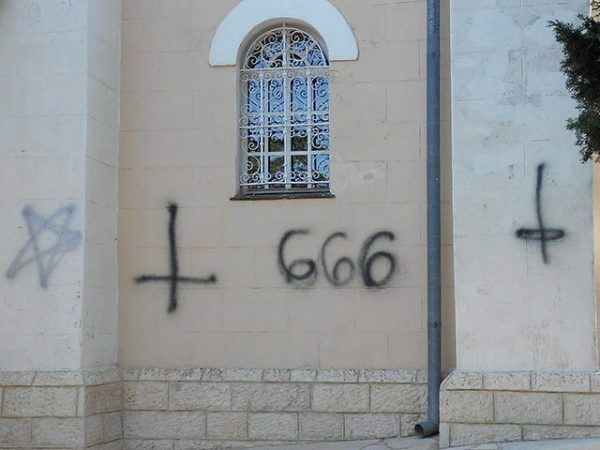 Moscow, April 18, Interfax - Unidentified criminals inscribed satan symbols with black and silver paint on the wall of St. Eliyah Russian Church in Israeli Haifa. The church sacristan Archpriest Miroslav Vitiv called these actions “barbarism at the lowest level,” HaifaRu city website reports on Tuesday. As expected, law enforcement officers will visit the territory of the church and register illegal actions of vandals in presence of Russia’s General Consulate official in Haifa. The same incident took place here in May 2002, when inverted crosses, five-pointed stars and the inscription in English “Satan was here” were made on the church walls. The church has a status of the representation and is situated at the land lot of the Russian Ecclesiastical Mission on Mount Carmel. It was built in 1913.